Stay by the Bay in La Porte, TexasOur city offers a hometown atmosphere on the north shore of Galveston Bay. 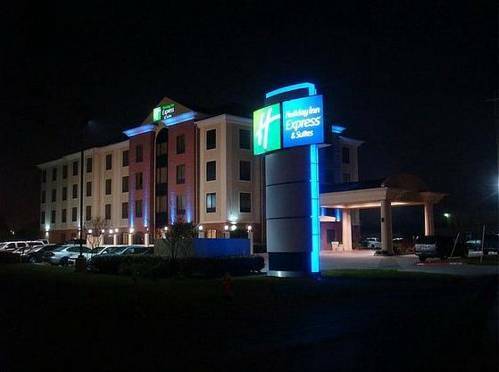 Just one mile from downtown La Porte and 25 miles from Houston, you can stay close to everything at our all-suites Holiday Inn Express Hotel in La Porte, Texas.This hotel's corporate guests can have a successful stay with free high-speed, wireless Internet access, a 24-hour business center and two meeting rooms that can accommodate up to 80 people. But great amenities aren't the only perks we offer - we are conveniently close to companies like Exxon Mobile, BP, Shell Oil, as well as the NASA Space Center, Maxim Crane and JV Industrial.From Port of Houston, sailing on the Galveston Bay, shopping at Baybrook Mall, dining at the Kemah Boardwalk to watching a live Houston Astros' baseball game at Minute Maid Park, there are a wide arrays of activities to do near our Holiday Inn Express Hotel in La Porte. Our Texas hotel's site offers easy access to Space City and the best of La Porte from the awe-inspiring Fred Hartman Bridge to the sandy shores of Sylvan Beach Park.Catch some rays by our sparkling, outdoor pool, watch the game on the 50" plasma TV in the lobby or recharge at the fitness center before exploring nearby sites. Other LaPorte, Texas hotels cannot compete with our modern amenities and complimentary, hot breakfast bar. So, come enjoy practicality and comfort with a name you can trust at a price you can afford. Conference Room: Host your meeting or event in our conference room. Holds up to 100 people, and we offer 6ft by 18in tables and chairs for setup too.